A few days ago I placed an order with Sleek MakeUP and picked a couple of products* being quite unsure on what to select I decided on 6 items that I would most likely need sometime soon. Blush by 3 (£10.00)*: I received my first Blush by 3 back in March -Pink Sprint, I was in love with how vibrant this shade is. Over the last year peaches/corals have gripped me so it was only right that I picked up 'Lace' to try out. The two matte and one shimmer shades have the names Chantilly, Guipure and Crochet. Blush (£4.49)*:When I first started taking make-up more seriously me & blush weren't very good friends. I found it more hard to apply and look right then anything else just because I didn't want to end up looking like a clown - now I can't do without it. 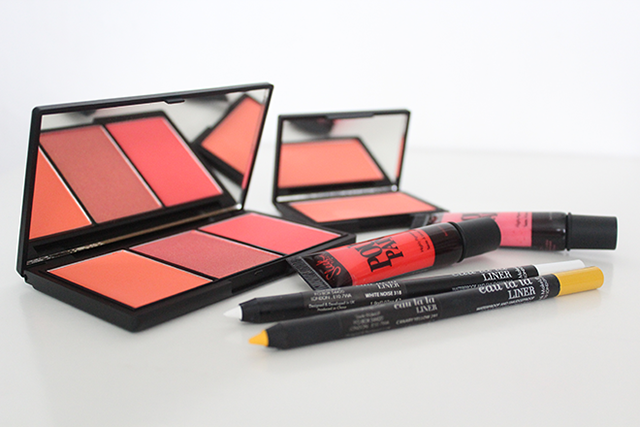 Life's a Peach by Sleek is a subtle, light peach that can't go wrong. Once swatched it does remind me of pastel chalk. Eau Eau Liner (£4.99)*:White eyeliner for me is just as much a necessity to me as a black one so I got White Noise alongside Canary Yellow after my success with getting yellow eyeshadow to appear bright on my eyes it's got me in a yellow mood and I want to try this as a future base. Have you picked anything up from Sleek lately? They are indeed. Thanks my love! I want these, great picks honey am yet2buy Sleek pout paints gotta love Sleek! The yellow looks soo pretty! Great buys.